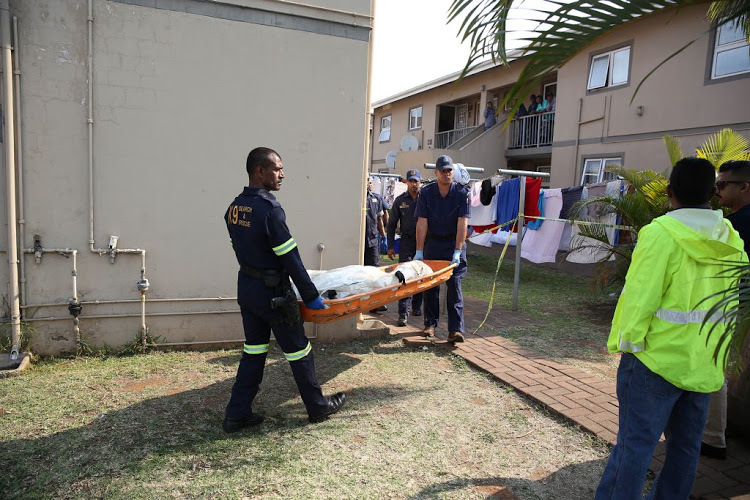 A horrific triple murder took place in a housing complex in Phoenix, Durban in South Africa on Friday which tragically claimed the lives of a mother and her two daughters. Found dead inside the cramped unit were 44-year-old mother, Jane Govindsamy, and her two daughters, 22-year-old Denisha and 16-year-old Nikita. The bodies of the Govindsamy family were discovered inside their Longcroft, Phoenix home after 8 a.m.
A relative of the family discovered the gruesome murders of the mother and her two daughters who went inside the unit. Mother and daughter Nikita were found both gagged. The relative alerted the authorities. It is not clear how the relative managed to gain access inside the unit. Denisha was initially thought to be missing until her body was later discovered stuffed into a cupboard after a thorough search was conducted by authorities. Family members cried as the bodies of the three victims were led into a mortuary van. The investigation remains ongoing. It is not clear yet whether the authorities have a suspect already, and if they have established a motive for the horrific killings. It is also not clear if the women were sexually assaulted before being murdered. It is not clear yet if the authorities have already interviewed the husband and father of the victims, and if he could shed light on the horrible tragedy that befell his family. Niggers and spics are animals and lack basic reasoning. They will murder all whites if they can.